The devastating earthquake of April 25 and subsequent aftershocks have caused major damage to the country’s schools and colleges — ranging from the pre-primary to the university level — compelling both the government and the private sector to cease classes for the next two weeks. Faced with serious shortage of fresh drinking water, essential commodities and an inadequate power supply, Private and Boarding Schools Organisation (Pabson) and NPabson, the umbrella bodies of private schools, have decided to close down schools across the country till May 15. Given the extent of the damage to school buildings and the prevailing national emergency in the country, there is no environment for teaching and learning at the moment, said Pabson chairman Lachhe Bahadur KC. Pabson and NPabson claimed that they have mobilised around 150 school buses to ferry school students to their hometowns. 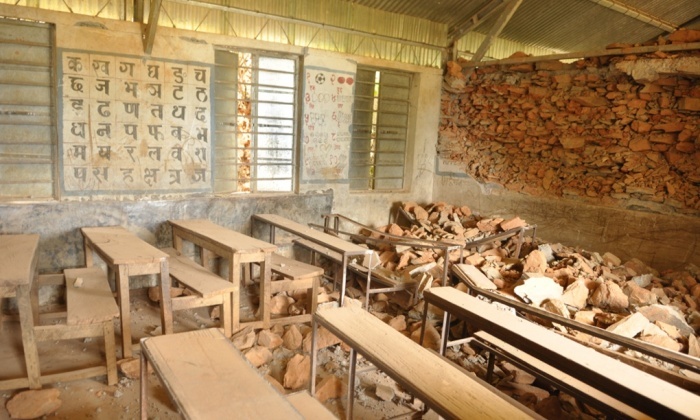 Durbar High School, which is Nepal’s first modern school with a history of more than a century and half, is one among many schools that were flattened in the devastating earthquake. The school, established in 1854, has been completely destroyed. Similarly,Kathmandu ’s Padmodaya and Juddodaya, Lalitpur’s Patan Secondary, Madan Smarak, and Tri-Padma, and Bhaktapur’s Sri-Krishna and Bageshwori Schools have all been levelled to the ground. The main administrative building of Tribhuvan University, the largest and oldest varsity of the country, has suffered great damage. The Offices of the vice-chancellor, rector and registrar have been completely destroyed while the planning and international divisions next to the administrative building, too, have been badly damaged. The Office of the Controller of Examination in Balkhu has also been destroyed, prompting it to postpone all examinations that were scheduled to begin next week.